Wow, every day we learn something new so It seems like I'll never run out of material for my list of commandments! Give end-users credentials to test your app and go on vacation leaving the user wondering what the heck is a verification code. Make sure you change the f$! @#%^ email address! Assume that Force.com can handle all type of attachments , there's a limit of 5 MB! Create a VF page just to show an image, use IMAGE in formula fields! Lately I've been involved in several discussions around how the Force.com platform handles object and record level security. I'm surprised that there's still a lot of confusion around this topic despite all of documentation available out there so I'll try to explain this topic in more detail. It usually helps to start the conversation referring to Jason Ouellete’s “Development with the Force.com Platform” book where he illustrates these layers of security as a funnel. Each request has to go through several layers starting with CRUD and FLS checks and then moving to verifying org-wide default sharing model and any exceptions to org-wide sharing model if applicable. If the request “survives” through all of these checks then access is granted. 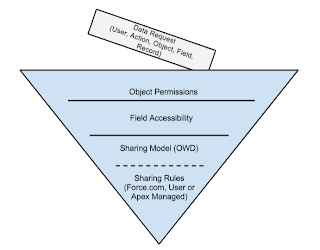 This funnel provides a great way to illustrate how data security works at a high level but it still doesn't explain all the nuts and bolts involved with sharing rules and how to enforce these levels of security when using Apex. I spent a few minutes today thinking about my experiences developing on the Force.com platform. Overall it has been great, nevertheless, there have been some bumps in the road (and there will be more to come). Here's a list of some commandments that I've come to think of as imperatives for development on Force.com. NOTE: This is just a list with no particular order of some of what I consider are the most important items. 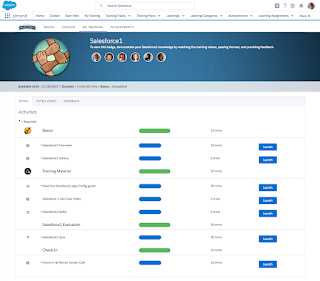 Almond is a Learning Management Application built on top of Salesforce1. The goal of this app is to create engaging learning experiences for your employees and reward them as they make progress through their learning activities. Learners can take quizzes, complete tasks and launch learning resources from a desktop or mobile device as well as provide feedback on the learning content. Why is it called almond? It all started with the idea of creating Learning Management ON Demand (LMOND) system and ended up adding an A in there because I think it's awesome, plus, almonds are tasty.